American Catholic History Classroom > Exhibits > The Journal of Sister Justina and the Santa Maria Institute > Elizabeth Bayley Seton, "The Charity of Christ – gentle, benevolent, universal,"
Document 2: Elizabeth Bayley Seton, "The Charity of Christ – gentle, benevolent, universal," from "Pyamingo Reflections," in Elizabeth Bayley Seton: Collected Writings, Regina Bechtle and Judith Metz, eds. (Hyde Park, New York, 3 vols.) IIIa: pp. 193-196. Elizabeth Seton, founder of the American Sisters of Charity, was a prolific writer of letters and journals. Many of her reflections are Scriptural and spiritual in nature, expressing her desire to follow Christ as closely as possible. 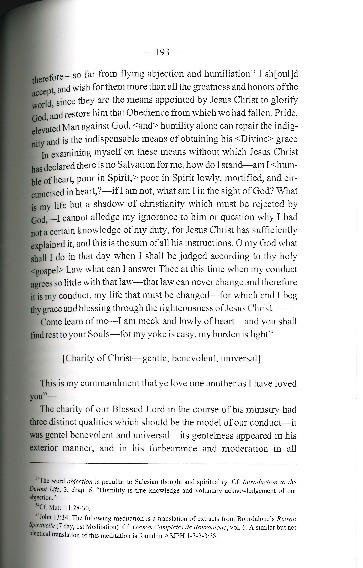 The excerpt below is taken from “Pyamingo Reflections,” a series of small notebooks Seton kept over a period of years; in it, she explores the qualities of Jesus' love as he ministered to others. The charity of our Blessed Lord in the course of his ministry had three distinct qualities which should be the model of our conduct. – it was gentle, benevolent, and universal – its greatness appeared in his exterior manner, and in his forbearance and moderation in all things. . .
. [H]e might justly say to us, "learn from me for I am meek and lowly of heart" = and am I as my blessed Lord – have I learned to bear the weaknesses of others. . . . it is absolutely necessary for obtaining Peace and perfecting Charity that I accommodate myself to them as much as possible and conciliate them by gentleness and kindness – "blessed are the meek for they shall inherit the earth." The same charity which Our Lord exercised to whose with whom he conversed and lived, called for the effects of his Divine power in actions of tenderness and mercy, for such was the warmth of his benevolence. . . . I am not enabled as Jesus Christ to do miracles for others, but I may constantly find occasions of rendering them good offices and exercising kindness and good will towards them – these are the fruits of Christian charity. . . .
Also the Son or God and after him his disciples has recommended the practice of universal charity as the most essential obligation . . . – If you do good only to those who do good to you, says our Lord, do not even the publicans do the same." but Evangelical charity should have a character distinct and Holy, raising it above that which is purely human . . . therefore our Lord is commanding us to love one another . . . comprehended [as] even those who have turned against us and from whom we have received the greatest injuries – "Bless then that curse you, do good to them that hate you, pray for them that despitefully use you and persecute you" – how rare and eminent is this degree of charity – yet rare and exalted as it is – still it is our duty, and Christianity and consequently religion can acknowledge no other charity as genuine and true, nor will any other be compensated by God.